Hopefully the classics will stay in service until summer of 2012 since I will be going down east next summer. Here is a clip of #5903, ex-Codiac 303. The lockup clutch isn't working on that V731! I was wondering that myself. It sounded like a few V series Allison transmission equipped buses that I have been on before. I see 303 got a repaint and got renumbered! I've heard Allison HTs and ZFs do that also whenever the lockup clutch isn't working properly. The Allison AT doesn't have a lockup clutch, so they all sound kind of like that. Can they not afford paint? It looks like such a sloppy system in person. Mix of buses may be cool to us as fans but it is hugely unprofessional to see when you're actually there! Judging from the number of dented panels and the high frequency of peeling paint, they probably can't afford much more then basic mechanical maintaince. Along with the fact that they hadn't ever purchased a bus brand new bus. It leads me to think that there is very little funding for transit out there. Also the system of routes is the most confusing I have ever seen, there do not seem to be any traditional route numbers. Rather there are bus numbers that are equivlent to run numbers. But each run is interlined on various routes. Overall it's a very confusing non-user friendly system. But quite a treat to transit fan no doubt! I seen a pic here of a classic and another page with an Orion 1, and a Cutaway. All but the first one are dead links. BTW, the last time I was in P.E.I. 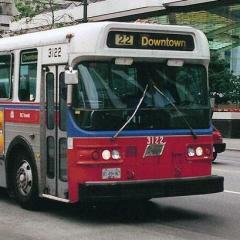 was June 2000...transit buses were very hard to find back then. just wondering if anyone has been to Charlottetown recently that can give us some update on the transit system there. I haven't been there since 2009 and wondering if they have any new equipment since then. Thank you! I see there is now a local transit service in Summerside. It seems to have started 03 July 2012 and it's operated by Trius Transit. It seems to have started 03 July 2012 and it's operated but Trius Transit. First of all, it is never safe to assume. Rather than speculate, let's wait until we have official word from Trius or a spotting from a fellow enthusiast who happens to visit Summerside. Second of all, it is not "buse's". It is a pet peeve of mine, but let's try to minimize spelling mistakes when posting. One bus, two buses (no apostrophe). Some people prefer to spell it busses and either one would be correct. The 's indicates possession. Spelt that way, it would indicate something in possession of the buse. I do not know what a buse is and second, whatever a buse could possibly own. Ranting over, let's get back on topic. Speaking of the classics are they going to be replaced at anytime? As of last May during my visit there, Charlottetown Transit(or T3 now) has no plans to replace any of their buses. Staffs mentioned that their replica "trolley" buses might last another 2, 3 years but god knows when they are going to fall apart? Some of the Classics look like they could use a bit of TLC too, hope those don't end up falling apart either! All of those Classic are done, except the 2 ex-Laval Classic which is still in Laval old livery and one needed a new engine. The Sunny bus or Zhong Tong bus, the ex-demo has sat for 1.5 year due to roof structural problem and smashed windows on a side. The T3 livery version is OOS and right now they are tight on buses as I was there. They also run the trolley replica to cover the remain in service while the ridership is growing, so who knows how long they can hold on before getting another used buses. Does this mean that there is the possibility that transit will get shut down due to lack of buses? I can't imagine the owners letting it get to the point of shutting down considering they pretty much run it on the subsidies they receive from those communities being serviced and 100% of the fare revenue goes back into the company. Money isn't an issue for the owners, they could go out and buy more buses anytime. But since their own mechanics can do the safety inspections in-house they can get away with running buses like they do in their NB coach operation... stuff that wouldn't necessarily pass the strict NSURB inspections in Nova Scotia. When i was there for the MBS fall convention a few weeks back, They did have a ford cutaway running in transit service. you ASSUME by yourself that they have no funding issue? Talk with the owner of Trius and he will give you an answer! The subsidy is SO little that they can bearly maintain the service, and they are looking at used transit buses again to replace the fleet now, due to shortage of funding! They have one cutaway pressed into transit service to cover some of the shortage. Cimon8000, I'd love to fill you in on some inside knowledge but due to previous issues of someone on this board directing that company's management team to posts where I was critical of their operations I can't risk breaching a former employer's confidentiality policy. But I'm pretty sure the parent company isn't exactly struggling given the number of brand new MCI, Prevost and cutaway-style coaches I see on Maritime highways each day proudly displaying that company's logo. If management doesn't step up and re-invest in the transit division it's not for lack of money, it's being cheap. And I certainly don't have a problem with used buses being purchased to make the numbers "work" at year end. As for the subsidy being so low, it was clearly indicated in the media when the company started running a transit system that the subsidy would be reduced year after year. The owners can't claim poverty status given that they signed the contract with each municipality they serve and knew where their finances would be in years to come. As for talking to the owners of that company, I'll pass and simply follow the good advice most people heed: "if you don't have anything nice to say, don't say anything at all". parent company's charter business has nothing to do with the contracted public transit business. They were only given a certain amount of subsidies on top of the fare they collected to run the public transit operation. From business perspective, who is going invest extra to purchase a brand new fleet if the subsidies and fare is just enough to cover the operation? I wish someone is out there to donate a new fleet of double decker, articulated buses for them to update their fleet but before this is going to happen, they are stuck with their aging fleet for now. Donations would be highly inappropriate in this case. The owners, especially the original partner. have wealth beyond what you've been lead to believe. He's done pretty good when it comes to personal and business finances. A good example is the well known startup and eventual sell-off of his freight transport business on PEI. You can't say the transit operation isn't connected to the coach operation for the simple reason that they both share a common pool of mechanics and support staff, they both buy parts from the parent company's NAPA parts dealership, they use common office, yard and garage resources. Their line run operation needs the profits from the charter and tour division as an internal subsidy (as explained during their NSURB licensing hearing) so it's not unexpected if a few dollars and resources from the coach work is used to prop up the city bus runs. What really surprises me is that they haven't the balls to demand government dollars, but that's probably a smart move as the backlash from taxpayers due to family connections to politicians would be quite severe. Like I said in a previous post I can't disclose stuff I know from working for the particular predatory operator but everything I typed above is public knowledge from NSURB/NBPUB records, media reports and from speaking with people familiar with the owners and their particular situation.